Snrky: I thought "Brand Vision" involved them stamping me with the corporate logo. I thought "Brand Vision" involved them stamping me with the corporate logo. Since we're on the topic I thought I'd share some wisdom on managing your personal brand as a corporate employee from smashingmagazine.com. Fortunately, no cattle prods or branding irons necessary. 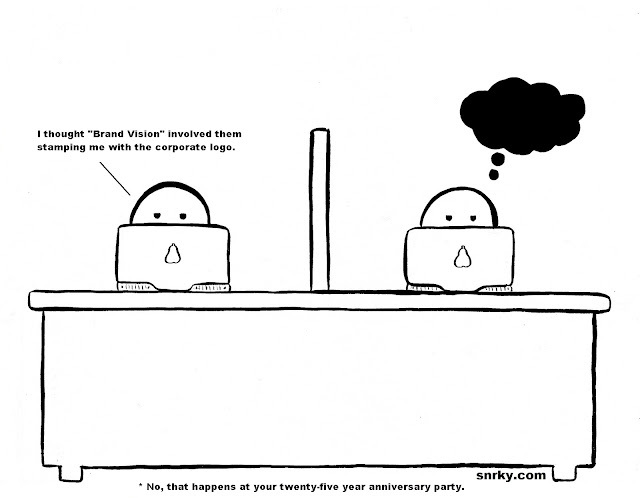 Title: I thought "Brand Vision" involved them stamping me with the corporate logo. Snarky: No, that happens at your twenty-five year anniversary party.